This is what happens when artists collaborate with civil engineers. These beautiful bottled buildings are wonderful, in the truest sense of the word. They are the result of a collaboration between artist Takanori Aiba and model-maker Kazuya Murakami. The finished products, stunning in their intricate detail, are the result of the alchemical mixture of skills and approach that the two bring to the work. All my creation comes from bonsai making, World of Walt Disney, and maze illustration. 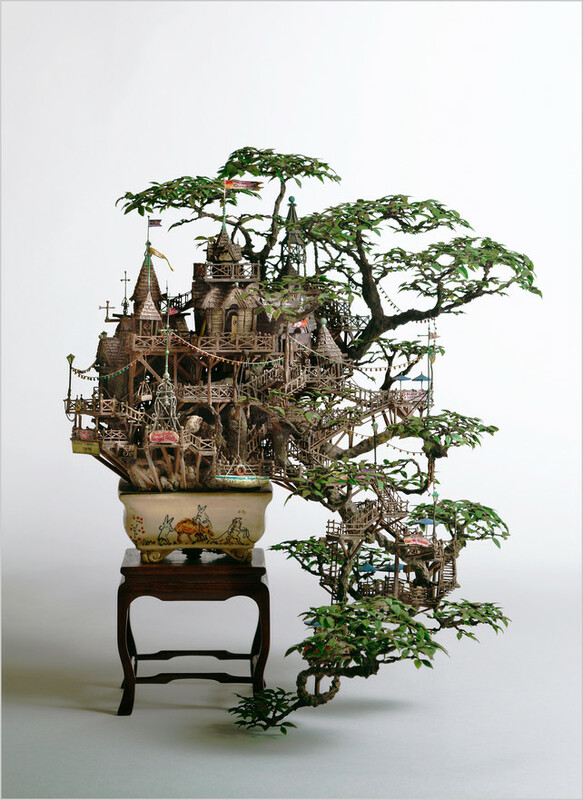 “All my creation comes from my early experience of bonsai making, World of Walt Disney, and maze illustration,” says Aiba. When he was young, he says, he was fascinated with small things. “I always got inspiration coming from imagining if I could be a Lilliput. … Maybe such small objects could be transformed to become huge, at the scale of buildings, castles, and the world itself.” He also drew inspiration from Disney’s Disneyland TV shows. Hosted by Walt Disney, the shows featured stories and settings like Sleeping Beauty’s castle, Frontierland, and the Nautilus from 20,000 Leagues Under the Sea. “I got into raptures over the TV show,” he says. Aiba began his career as a freelance maze illustrator in 1978. (Did you know you could be a freelance maze illustrator?) Later, he moved into conceptual work for catering companies that fused food and entertainment. In 2003, he met Murakami. Tetsuya Okamoto, the team’s public relations and translator explains their working method. Aiba begins with a perspective drawing. Murakami responds with a series of study models. “In engineering, it would be a proper way to make an object based on architectural drawings,” says Okamoto, “but Murakami does not use any of these drawings on purpose.” Instead, they work organically by examining the models and discussing whether the physical prototype matches the mood of Aiba’s imagination. They make progress “by finding the best solution from innumerable solutions.” All told, it can take six months to a year to get from drawing to finished product. The biggest struggles are in making the models look naturally aged. The models are made by hand, using an X-Acto knife and glue. The materials change from project to project and include clay, wood, plastic, resin, and steel. “All nonperishable materials can be used for any formative depiction,” says Murakami. “I’m always searching for new materials to realize Aiba’s wide range of imagination.” The biggest struggles are in making the models look naturally aged and in stringing the LED lights inside the model, he says. “His making process is like a puzzling,” says Okamoto, “His engineering interpretation and aesthetic sense for reading and reproducing Aiba’s unique imagination are essential parts of Aiba’s finished work.” Okamoto likens the entire method to reverse engineering. “Reverse engineer of dreams.” Now there’s a job description.